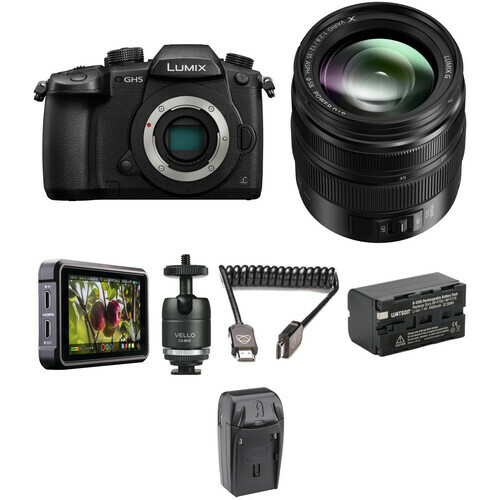 Configured for the aspiring filmmaker, the Panasonic Lumix DC-GH5 Mirrorless Micro Four Thirds Digital Camera with 12-35mm Lens and Ninja V Kit from B&H bundles the multimedia mirrorless body and fast Lumix G X Vario 12-35mm f/2.8 II ASPH. POWER O.I.S. zoom lens with an Atomos Ninja V 5" 4K HDMI Recording Monitor, a power kit for the external monitor, a mount for attaching the monitor to the camera, and an HDMI cable. Upgraded, redesigned, and filled with features, the Lumix DC-GH5 Mirrorless Micro Four Thirds Digital Camera from Panasonic provides an outstanding imaging platform for shooters who demand some of the best video and still photography quality they can get in a single compact camera. At the heart of the camera is a 20.3MP Digital Live MOS sensor and a newly developed Venus Engine processor, which both offer dramatically improved processing times over its predecessor. This enables the ability to record 4K video at up to 60 fps, 10-bit 4:2:2 internal recording with select settings, Full HD video at up to 180 fps, 12 fps continuous shooting, and sensitivities up to ISO 25600. Also, the camera features built-in 5-axis sensor stabilization, which can work with certain lenses to activate Dual I.S. 2 for highly effective shake correction that can compensate for up to 5 stops of shutter speed. Other improvements include a speedier and more accurate Advanced DFD autofocus system that can lock on in just 0.05 seconds, as well as 6K PHOTO at 30 fps and 4K PHOTO at up to 60 fps. Along with all these internal improvements, the body received some significant upgrades as well. For viewing and composing images both the 0.76x OLED viewfinder and 3.2" free-angle touchscreen received resolution bumps to 3.68m dots and 1.62 m dots, respectively. This will make shooting more comfortable and more accurate. The magnesium alloy body is now freezeproof to 14°F in addition to splash and dustproof. For fast image transfer and saving, there are now two UHS-II SD card slots. Additionally, for a completely wireless setup it offers both Wi-Fi and Bluetooth for advanced functionality when paired with a mobile app. Packing in a newly developed 20.3MP Digital Live MOS sensor without an optical low-pass filter and a new Venus Engine processor, the GH5 claims to produce the best image quality to date from a Lumix camera. Using Multipixel Luminance Generation and Intelligent Detail Processing, it will maximize sharpness and details as well as accuracy in a variety of lighting conditions. It offers excellent three-dimension color control and precise noise reduction techniques to help with shooting at sensitivities up to ISO 25600. It also enables shooting speeds of up to 12 fps with AF-S or manual focus modes. The GH5 is an exceptionally capable video camera in addition to its outstanding stills capabilities. The flagship feature is UHD 4K video at up to 60 fps, though another excellent spec is the ability to record 4:2:2 10-bit files at resolutions up to DCI and UHD 4K at 24/30 fps. A full-size HDMI port is present on the camera for high-quality output at 4:2:2 10-bit in all settings for use with external monitors and recorders. The camera also offers high bit-rate recording for highly detailed images free of compression artifacts. For more advanced users, multiple picture styles are available to provide a more gradable image, such as CINELIKE V and CINELIKE D, as well as an in-camera LUT to make monitoring easier. Also, users will have access to overcranking and undercranking settings which provide speeds up to 2.5x slower in 4K (60 fps) and 7.5x slower in Full HD (180 fps). Also, a 4K Anamorphic mode is available, which will let you record in a proper 4:3 ratio for adjustment in post-production. The GH5 is designed to be an expandable system, with multiple options available to help improve video recording capabilities. Examples of this are an optional V-Log L upgrade and separately available accessories such as the XLR Microphone Adapter that provides XLR inputs and physical controls through a hot shoe connection. Users can also use standard microphones and headphones via the 3.5mm input and output jacks. Burst: This mode will allow you to continuously record, making it ideal for instances where you need a fast frame rate in order to capture the best moment. Pre-Burst: This mode is ideal for times when you're unsure of the critical moment to press the shutter button and will record images one second prior to and one second after pressing the shutter button in order to give you 60 frames to choose from. Burst (S/S): This mode most closely follows the video recording process, and allows you to playback your video, pause at the chosen moment, and use the shutter button to mark a chosen frame from the video and save it as a single 8 or 18 MP frame. Helping to achieve the utmost sharpness when photographing handheld, Dual I.S. 2 combines the GH5's sensor-shift image stabilization technology with lens-based image stabilization to compensate for a broader range of movement types to render sharper, clearer imagery. Dual I.S. 2 requires the use of compatible Lumix lenses featuring O.I.S. This stabilization system is able to compensate for approximately 5 stops of camera shake. A large OLED Live View Finder has an impressive 3.86m-dot resolution and 0.76x magnification for eye-level composition. A larger means for image composition and playback, the 3.2" 1.62m-dot rear RGBW LCD monitor has a free angle, tilt and swivel design to support viewing from a variety of angles. It is also a touchscreen, which permits intuitive menu navigation and settings control. Dual UHS-II SD card slots are present which provides settings such as Relay Recording to automatically switch cards when one is full; Backup Recording, which recording the same data to both cards simultaneously; and Allocation Recording, which lets you save certain files to each card for easier organization. Constructed from magnesium alloy with die-cast front and rear frames, the GH5 features a durable design that also incorporates extensive sealing at each joint, dial, and button to render it both splash- and dust-proof as well as freezeproof to 14°F. A joystick is available on the rear of the camera to make changing many settings easier and more intuitive, such as changing a focus point. The sleek flat-body profile incorporates both front and rear dials for intuitive control over aperture and shutter speed settings. Multiple assignable function buttons are also available, as well as a dedicated exposure compensation dial. Built-in 5 GHz Wi-Fi connectivity with NFC and Bluetooth 4.2 Low Energy allows for wireless image sharing and remote camera control from linked smartphones and tablets. Bluetooth LE also enables a constant connection to your mobile device, allowing for functions such as geolocation and automatic image transfer. For accelerated autofocus performance, and Advanced DFD (Depth-From-Defocus) technology is employed to quickly calculate the distance to subjects and adjust the focusing position in as little as 0.05 seconds, which enables continuous shooting up to 9 fps with continuous AF. This contrast-detection type focus method benefits both still and video recording modes, as well as subject tracking applications where subject color, size, and motion vectors are used to intelligently lock-onto the moving subjects and ensure precise focus. The sensitivity and speed can be adjusted to further improve performance with certain subjects. It also features 225 AF areas which provide excellent control over where the camera will focus. Additionally, supporting working in low-light conditions, a Starlight AF feature enables accurate AF performance down to -4 EV. Depending on the lens in use, the included DMW-BLF19 battery provides approximately 400 shots per charge when using the rear monitor, or 380 with the electronic viewfinder. Full HD 4:2:2 10-bit video recording. 400 Mbps 4:2:2 10-bit All-Intra video recording in 4K 30p, 25p, and 24p as well as Full HD. Hybrid Log Gamma in Photo Style mode for 4K HDR video recording. A versatile zoom covering wide-angle to portrait-length perspectives, the Lumix G X Vario 12-35mm f/2.8 II ASPH. POWER O.I.S. Lens from Panasonic is designed for Micro Four Thirds cameras, where it provides a convenient 24-70mm equivalent focal length range. A constant f/2.8 maximum aperture affords consistent performance throughout the zoom range, and benefits working in difficult lighting conditions as well as enables greater control over depth of field. The sophisticated optical design employs a series of aspherical, low dispersion, and high refractive index glass elements to control a variety of aberrations and distortions for sharp, clean image quality and a Nano Surface Coating has also been applied to reduce ghosting and flare. A POWER Optical Image Stabilizer minimizes the appearance of camera shake to suit handheld shooting, and this O.I.S. system is also compatible with Dual I.S. for enhanced stabilization performance. Additionally, the lens also features a durable all-metal housing that is dust, splash, and freezeproof to enable its use in harsh climates. Standard zoom for Micro Four Thirds mirrorless cameras, this lens provides a 24-70mm equivalent focal length range. Bright constant f/2.8 maximum aperture maintains consistent performance throughout the zoom range. Four aspherical elements, one ultra extra-low dispersion element, and one ultra high refractive index element all contribute to minimizing chromatic and spherical aberrations and various aberrations in order to produce a high degree of clarity, sharpness, and color accuracy. Nano Surface Coating has been applied to individual elements to reduce flare and ghosting for improved contrast and color neutrality. POWER Optical Image Stabilizer minimizes the appearance of camera shake for sharper handheld shooting, and also supports the Dual I.S. function for increased stabilization performance. Splash, dust, and freezeproof design benefits working in inclement weather conditions. Rounded seven-blade diaphragm contributes to a smooth and pleasing bokeh quality. The Atomos Ninja V 5" 4K HDMI Recording Monitor is a 5" on-camera monitor/recorder that records and plays back DCI 4K, UHD 4K, and HD video from purpose-built mini-SSDs. It features a 10-bit FRC IPS screen with a brightness of 1000 cd/m², which makes it suitable for use in both exterior and interior conditions. The AtomHDR display technology allows you to accurately monitor your log gamma footage without having to view flat, washed-out looking images or use a LUT to compress the dynamic range and color space. The monitor supports popular log formats from Sony, Canon, Panasonic, ARRI, RED, and JVC cameras. The settings only affect viewing, with recorded video remaining unaltered. Built to withstand the rigors of production, the Ninja V features an aluminum chassis and powers from a single L-series battery. Additional features include a variety of onscreen exposure analysis, framing, and focus assist tools, as well as anamorphic de-squeeze. A power supply and SSD Caddy are included with the unit. Designed with an interface that differs somewhat from prior units, the Ninja V's HDR functions are accessed through the MON buttons and its ProRes options are chosen via the arrows on the unit's upper left corner. The Ninja V can record to both AtomX SSDmini or standard 2.5" SSD drives, fitting up to 150 minutes of 4K video on an 1TB drive. Separately available AtomX Ethernet/NDI and SYNC Expansion Modules enable you to output live video over IP or add wireless timecode for multicamera shoots respectively. With AtomHDR you can monitor up to ten stops of dynamic range of your camera's LOG image. Most conventional monitors can only display six or seven stops, which is fine for standard footage; but a Log image will look overly flat. It is also superior to monitoring with a loaded LUT, which can clip the highlights and mask shadows. Record high-resolution 4K footage in DCI or UHD formats up to 60 fps, including 24 and 25 fps for a more film-like aesthetic. All recordings are stored as high-quality Apple ProRes or Avid DNxHR files with 10-bit 4:2:2 chroma subsampling. A variety of bit rates are available to fit your project and storage needs. Record to standard 2.5" SSD drives or to compact AtomX SSDmini drives, capturing up to 150 minutes of 4K video on a 1TB drive. Input/output audio via HDMI or add external audio via the 3.5mm Line In/Mic In port; output audio using the 3.5mm headphone port for convenient audio monitoring. The Ninja V features a 5" IPS LCD screen that is illuminated by a bright 1000 cd/m² LED backlight, making it possible to view in daylight without requiring a hood. Plus, the screen is also color calibrated from the factory to ensure accurate image representation. Log and HDR signals can be difficult to monitor with conventional equipment. Though, with the Ninja V's built-in HDR signal management functions, the log signal can be converted to the PQ standard for compatibility with existing consumer and professional HDR equipment. The Ninja V supports Anamorphic de-squeeze, allowing you to comfortably view anamorphic footage with a squeeze of 2x, 1.5x, 1.33, and Panasonic's 8:3. Incoming video signals can be recorded in a wide range of Apple ProRes and Avid DNx codecs which maintain high quality while not requiring the storage space of uncompressed video. Both ProRes and DNx are edit-friendly, requiring no conversion in post-production to ensure smooth playback and compatibility with most common video editing software. The Ninja V features a bidirectional high-speed video port along with power and audio which enables the use of the AtomX Ethernet/NDI and SYNC modules along with future module releases. Add a monitor to your video recording system with this aluminum Heavy Duty Camera Shoe Mount Adapter with Ball Head from Elvid. This convenient accessory mounts directly to a camera's shoe mount, and allows for the attachment of a full array of video accessories. Specifically meant to attach monitors or small lights to your camcorder or camera while shooting video, this ball head has a single locking knob for fast and safe operation, and is easily removable. Accessories attach via the 1/4"-20 screw thread on top, and the bottom features a removable shoe mount and a 3/8" thread. The shoe mount itself is removable and features its own 3/8"-16 mounting screw, in case you want to use it without the ball head. Note: Due to its compact design, this ball head should not be used to support a camera. The 19.7 to 25.6" Full HDMI to Full HDMI Coiled Cable from Atomos is coiled to prevent clutter, but it can extend up to 25.6". The Atomos Power Kit includes two NP-F750 5200mAh batteries, a charger, and a power adapter for the Shogun/Ninja Inferno and Flame. Box Dimensions (LxWxH) 7.5 x 6.0 x 5.8"
Box Dimensions (LxWxH) 6.4 x 4.6 x 4.6"
Box Dimensions (LxWxH) 7.7 x 5.7 x 4.3"
Box Dimensions (LxWxH) 3.95 x 3.8 x 1.55"
Box Dimensions (LxWxH) 6.0 x 4.5 x 0.709"
Box Dimensions (LxWxH) 7.2 x 4.35 x 3.8"
Lumix DC-GH5 Mirrorless Micro Four Thirds Digital Camera with 12-35mm Lens and Ninja V Kit is rated 4.6 out of 5 by 147. Rated 4 out of 5 by Anderson from Outstanding Color - Great Formfactor The 422 internal color capture at 4k is amazing! It rivals the C300 mk2. The only real challenge is the codec when editing. You really need a MONSTER of a computer to edit these files "as is". That's why I've only given this camera 4 out of 5 stars. I've just been converting the files to ProRes before I edit them. It's a hassle, but worth the color quality. The Image Stabilization is BANANAS!! Love it. Rock solid images with the IS in-body and in the lens. Granted, this is a micro four thirds sensor, but I've gotten some decent shallow depth of field with the 12-35mm f/2.8 Panasonic lens. Seriously thinking about getting a second one. Rated 5 out of 5 by Koji from Amazingly good MFT camera GH5 levels up with waveforms and scopes, usable 120 fps, amazing 5-axis stabilization (when paired with dual I.S. lenses) and more customization than you could ever need. There's a "tripod mode" stabilization feature called I.S. Lock that no one is talking about that's truly a game changer for in-camera stabilization. Being able to switch on the fly from "handheld" stabilized to "locked down" stabilized is extremely useful shooting weddings without stabilizers or sticks. I haven't had a chance to grade the 10bit just yet but looking forward to saying goodbye to banding issues that plague in-camera recording on virtually every other camera sub 5k. Rated 5 out of 5 by Chapin from Worth every single penny I am a professional content creator and have used the GH4 metabones to canon EF for the last 2 years. I upgraded to the GH5 and decided to use the Lumix 12-35 2.8 ii instead of the EF lenses. I cannot believe this camera! Even for stills... I no longer run to my canon. I can walk into any situation and produce amazing video and stills all handheld. The low light is still not as good as the current Sony's but the GH5 can hold high ISOs and the noise has a film grain look to it which is awesome. A massive improvement over the GH4 I highly recommend this camera to everyone. Rated 5 out of 5 by Derek from The Legend Is Back, And Better Than Ever! The GH5 is the stuff of legend. This feature packed camera is capable for both stills and video. The rugged build quality and mostly good ergonomic make this body inspire confidence, regardless of where you may be. The GH5 is a professional tool, priced at a prosumer level. While lowlight is not perfect in movie mode, it is better than most dedicated Cinema cameras. Battery life is good. The back flip out screen is handy for taking creative shots. In the right hands this camera is a serious creative weapon. And being a M43 system camera means you can rig it to be as large or as small as your gig requires. The specs speak for themselves. If you are thinking about it, well just hit add to cart. Rated 5 out of 5 by Zach S. from The best camera I have ever used! I love this camera, the quality is crisp and clear, the color is clean and organic. I am coming from shooting on the Canon 5D Mark III. I love the accurate focus peaking and zebras, as well as the swivel touchscreen as well as many other features. The 5D just doesn't cut close to a number of features this camera has. The handiness of all these little features allows me to work much faster and more effectively than any other camera I have used in this price range. I am a run-and-gun shooter. I need to have my camera ready at a moments notice. Put a speed booster on the camera and it is pretty good in low light as well. Rated 5 out of 5 by FlemFilms from Nothing Better for the Price This camera is by no means perfect for video (what else would anyone purchase it for?) but it is the absolute best you can get anywhere close to this price. Pros: High frame rates, internal stabilization, full sized HDMI, greatly improved image from the 4, higher bit rates and 422 color. Cons: Noise in low light (better than the 4), very noisy at higher ISO (no point going above 1600), watch out for some weird artifacting when combining internal stabilization with lens stabilization and camera movement (note- I'm using an older model Lumix 14-140, so this could be part of the issue). Rated 5 out of 5 by Mr Lee from Best Bang for your buck! Although I bought this with the intent to use it for videography, because of its video capabilities, I was pleasantly surprised at the stills the camera is capable of producing. The noise is minimal even for a MFT sensor. Definitely a run and gun camera or probably the best overall camera. If your intent is capturing video, but want to be able to take excellent stills, you should consider this camera. It may not take 50mp stills, but it'll take really good stills, if you don't need huge files and just want excellent family photos or portraits. I can see this camera as a perfect camera for traveling or outdoor adventures due to its size and weight. Perfect for the wanderer who does not want to carry all their gear. Will make an excellent run and gun. Pairs perfectly with the zhiyun crane for amazingly smooth video. Do Two Point Focus Transitions work using the touchscreen, when recording in 5K 'Open Gate' mode ? We find not restrictions in using the Focus Transitions feature and open gate. We do find the following restrictions.Focus Transition in not available:When Variable Frame Rate is setWhen 4K Live Cropping is setWhen Color Bars is setWhen an interchangeable lens that does not support the Focus Mode AFC is used. How long can it shoot 3840x2160 @ 24fps internally on 64GB card? It will shoot until the card is full, because it does not have any 29 min 59 sec limitations. You would get roughly 10 minutes at 10-bit 4:2:2 or under 60 minutes at standard rates. Is there a Sony-like Clear Zoom feature? The GH5 has a mode called Extra Tele Conversion which is very similar to the Sony Clear Image Zoom . In HD mode the Extra Tele Conversion will give you an additional 2x zoom and in 4k it will be 1.4x. how long does the battery last shooting the highest res 1080p? You get about 200 minutes recording video per battery. As always, we suggest if you are doing more than casual shooting, get extra batteries. Will gh5 have IBS like sony cameras? Has there been any hint that there will eventually be a new one-piece AC adapter for the GH5 or will we have to rely on the same one sold for the GH4 that has to be purchased in 2 separate pieces? We have not heard any word of a new, one piece AC power supply for the GH5. However the GH5 will be able to use the same power supply option as the GH4, which are B&amp;H Numbers PADMWAC10 and PADMWDCC12. This camera comes with a standard 1 year USA warranty from the Panasonic. As far as we know there is no recording limit, beyond the capacity of your memory card, with the Open Gate Anamorphic Mode. Audio should work just the same as well. As far as a memory card for 200mbps a V60 card is more than enough. A 512GB card like B&amp;H # ANAV512SDV60 should work. We do not have any specific info on if Digital Focus Pull and IBIS work in 5K Open Gate Anamorphic Mode though. It is also unlikely you will be able to tether to see the image in the way you described. You will probably be limited to the on-board screen.